"Now get potential insurance savings plus extra protection—with the traditional beauty of Timberline® shingles." Passes UL 2218 Class 4 impact test, and may qualify for insurance discounts of up to 30% or more (check with your insurance agent). Each shingle is labeled with special information needed to qualify for premium discounts according to the requirements of the Texas Department of Insurance—a standard that most hail insurers accept. Revolutionary design includes FLX™ formula for rubber-like flexibility and ArmorStrip™, a patent-pending puncture resistant elastomeric tape, for maximum impact resistance. Heavyweight design and extra-strong Micro Weave® Core for longer life and extended durability. Class A fire rating from Underwriters Laboratories—the highest rating possible (unlike most wood shakes with a Class C fire rating). StainGuard® Protection... helps protect the beauty of your roof from unsightly blue-green algae. WeatherBlocker™ or Pro-Start™ pre-cut starter strip shingles provide an upgrade that can save time, eliminate waste, and reduce the risk of blow-off by tightly locking your shingles in place along the rakes and eaves. For maximum insurance savings, use only Seal-A-Ridge® ArmorShield™, UL 2218 Class 4 ridge cap shingles. 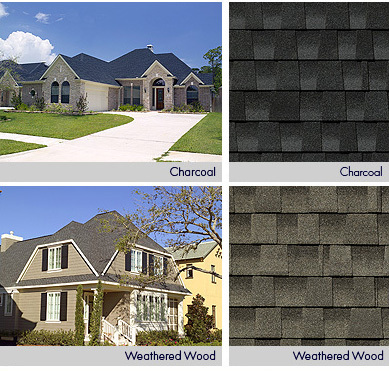 They’re also a unique color match to the Timberline® ArmorShield™ II shingles. The UL 2218 impact test was developed in conjunction with insurance industry leaders—and ArmorShield™II shingles pass at Class 4—the highest rating possible. Check with your insurance agent about potential savings on your homeowners insurance. * Size: approximately 12" x 12"